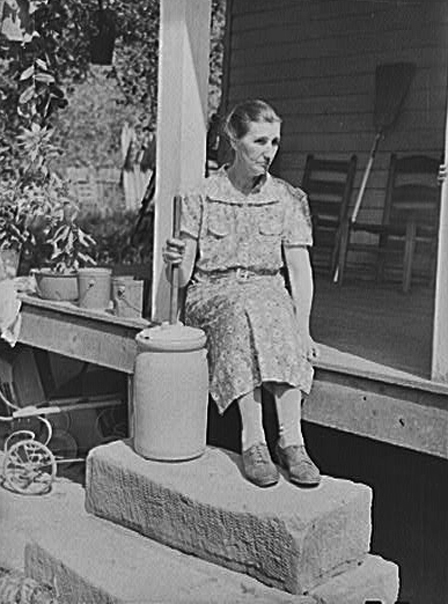 In the original Kit books, readers meet Aunt Millie, who lives in the fictional community of Mountain Hollow, Kentucky. 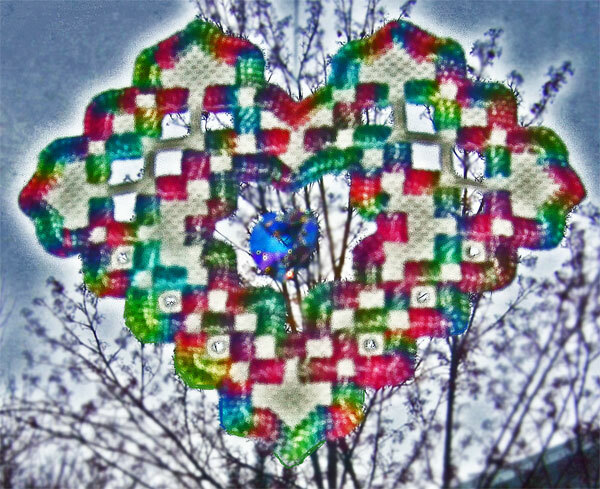 Setting the mystery in that region, during a visit Kit makes to Aunt Millie, opened up all kinds of new possibilities. 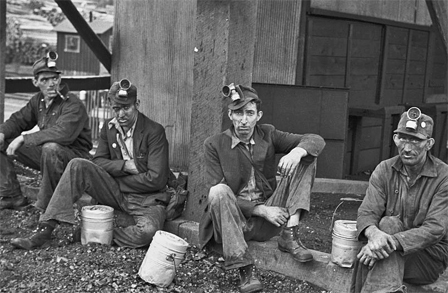 I did some preliminary reading about Eastern Kentucky during the Great Depression. Then I headed to Kentucky! 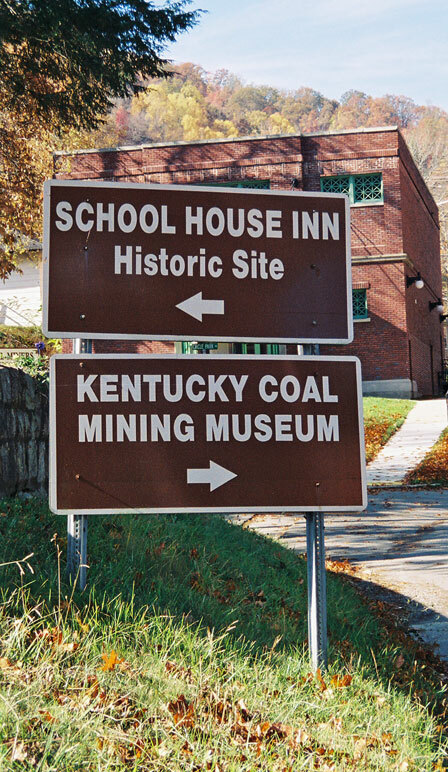 I started at the Kentucky History Center. Members of the Folklife Program staff showed me some of their collections, recommended people I should talk with, and suggested places to visit. Then I visited the archives. The staff there helped me identify some wonderful audio tapes made in the 1960s. Elderly people were interviewed about their lives, and many of them talked about life in the mountains during the Great Depression. I learned a lot, and picked up some great details to use in the mystery. After that, I was ready to go exploring! I stopped at a number of museums, libraries, and historic sites. 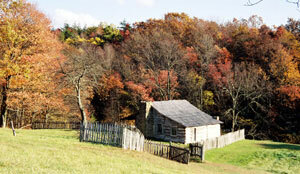 One of my favorite places was the Hensley Settlement, part of Cumberland Gap National Historical Park. 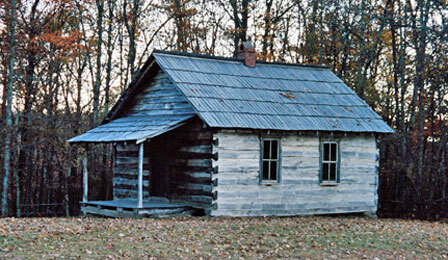 The Hensley Settlement was established on top of Brush Mountain in 1904, and was occupied until 1951. I was able to tour the preserved buildings in this remote community. 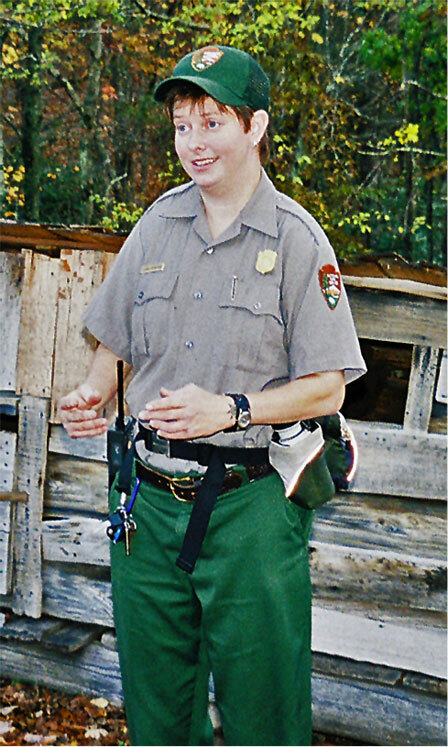 The park ranger who led the tour was great! 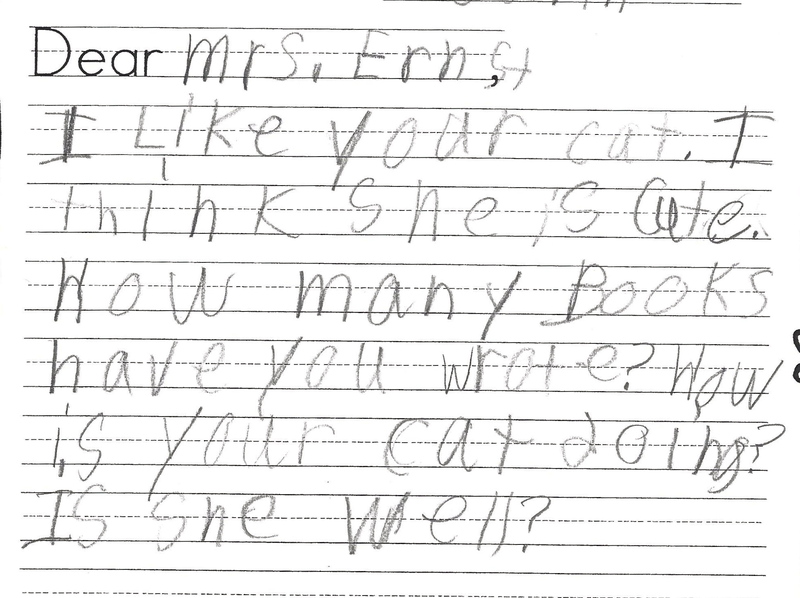 I loved being able to walk into the Hensley Settlement School. Whenever possible, I try to look at a variety of sources relating to a particular topic I’m researching. To learn more, I decided to look for old photographs. 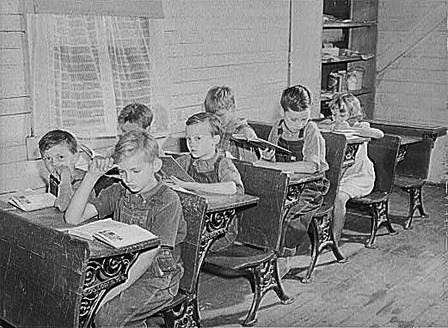 When I got home from that trip, I searched for images of schools in the Kentucky mountains during the Great Depression. 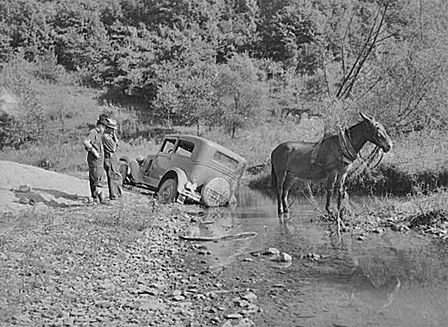 I was able to find many photographs taken in Eastern Kentucky during the Great Depression. Some of the photographers were hired by the government to document life in the mountains. 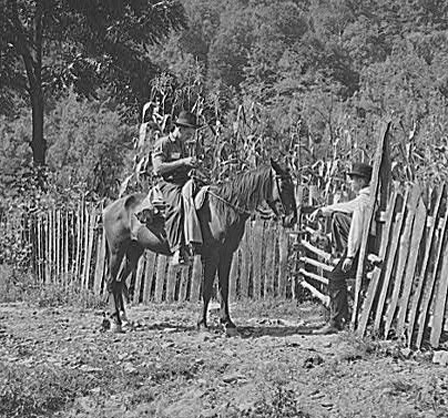 All of the historic photographs on this page are part of the Farm Security Administration collection in the Library of Congress. 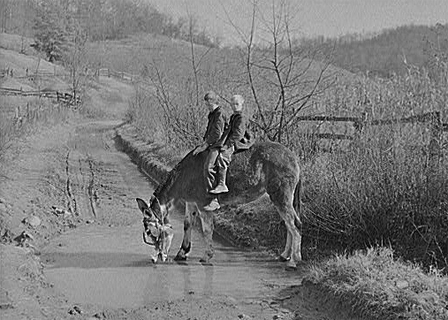 They were taken by Marion Post Wolcott. The number beneath each photograph is its identification number. Or the potted flowers on the porch, and the type of butter churn this woman is using. Portraits like these also help me imagine characters. Do these people remind you of anyone in Midnight in Lonesome Hollow? Photographs also help me develop scenes. After seeing this one, I wrote about Kit and her friends using creek beds as paths in steep terrain. 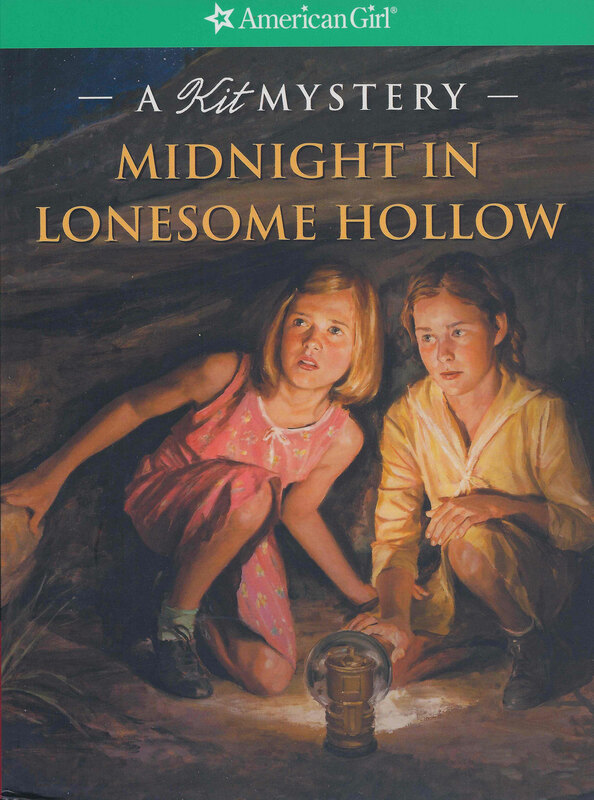 A mailman on horseback stops to deliver letters, packages, and news—just as Mr. Tibbets does in Midnight in Lonesome Hollow. 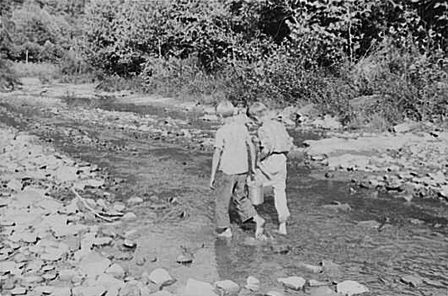 The steep mountains in rural Kentucky provided lots of transportation challenges during Kit’s time. 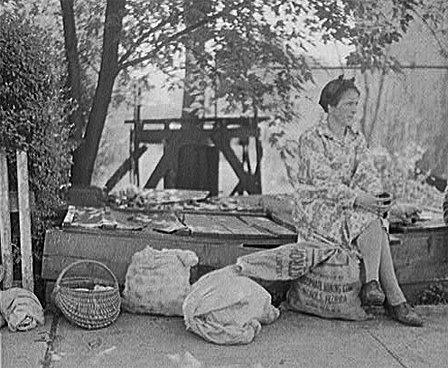 The photograph below was labeled “Mountain woman with groceries and supplies resting by the roadside.” During the 1930s and 1940s, people were switching from using home-made items to store-bought ones. Although this woman brought some sacks to carry her supplies, she still carried one beautiful basket as well. You can find more photographs by visiting the Prints and Photographs section of the Library of Congress website. Perhaps you’ll find photographs taken during the Great Depression in your area! PS: My visit to the Hensley Settlement in Cumberland Gap National Park on that gorgeous autumn day inspired me to write several poems. 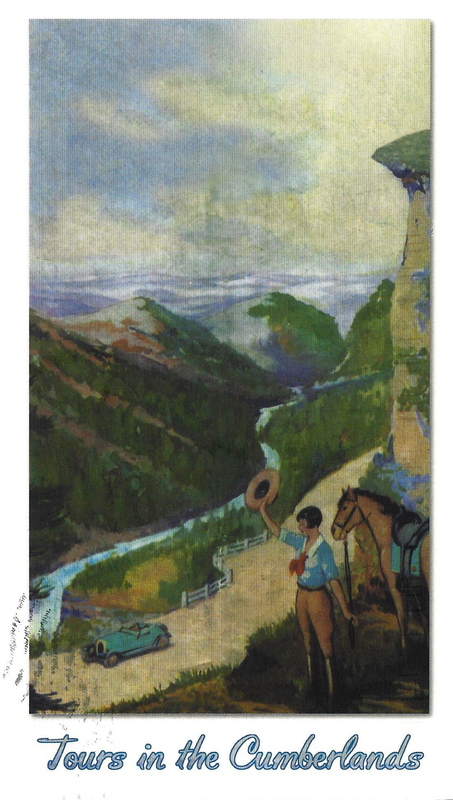 One of them, “Inarticulate, 1908,” was published in a journal called Appalachian Heritage. That was my first published poem!